Click here for the website of the Bologna Surveillance Camera Players (SCP-Bologna). The SCP-Bologna group was formed in the wake of Bill Brown's May 2001 trip to Italy. Click here for Bill's account of the performance in which he participated, and here and here for accounts of the performance in the Italian media. Since May 2001, the SCP-Bologna has performed a total of four times: twice in 2001 (no documentation available), 15 March 2002 and 11 September 2002 (see above). What follows is a translation of the statement released by the SCP-Bologna in advance of 15 March 2002 performance. "We like to be watched by surveillance cameras, because we are the Surveillance Camera Players"
"It is not true that those who protest against surveillance cameras have something to hide: we appear in public life without fear to highlight the reality of social control." Back in 1996 in New York, some people started taking to the streets to reclaim their privacy rights in a particular way: they started doing theather in front of surveillance cameras. In performance after performance, they put on theatre pieces for the discreet (almost hidden) eyes of the hidden powers who watch in the streets and in the public squares that are controlled by electronic eyes. These plays and the manner of their performance provoked the curiosity of passers-by and the mainstream media, as well as the attention of the US military. Since then, the Surveillance Camera Players (SCP) haven't stopped talking about themselves and their bizarre performances. They have influenced other people in cities in other countries. Today, SCP groups exist in America (of course) and in both East and West Europe. An SCP group has been active in Bologna since June 2001. 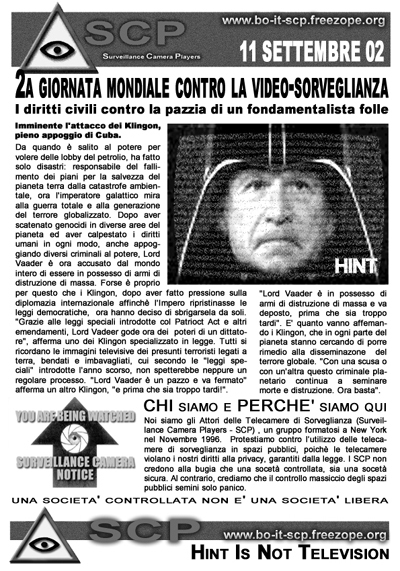 Friday, 15 March 2002, in the most surveilled public square in Bologna, the SCP will, for the very first time, perform "H I N T: all you want to watch on TV" for the discrete watchers behind the surveillance cameras. H I N T is the answer to the need for new languages, for new communication channels. H I N T is stimulating, impertinent, strange and disturbs the habitual frequencies. H I N T is a mediatic action of the SCP: a variety program, in an informational format, culture . . .
Roma 16 marzo 15 Piazza Esedra :: http://italy.indymedia.org. H I N T: you can watch it Friday the 15th of March at 4 pm on the streets of Bologna. H I N T is like love: you can't buy it; you do it.